Your first task is to release and use the first key. After that you have to do the same thing with the second key. 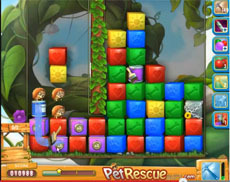 The level can be completed easily if you keep a paint brush booster in the left part of the screen to use it in the bottom of the level, to rescue the 3 pets. If you don’t make it to keep it till the end, you can rescue the pets by using the hammer booster, that it will be activated while clearing the blocks in the right part of the screen. In case you are stuck on Level 503 you should definitely watch our vid!